Can statues be toys? I’ve been asking myself that question since my early days of collecting, particularly when McFarlane toys started to systematically eliminate articulation with each new update of their Spawn figure series. 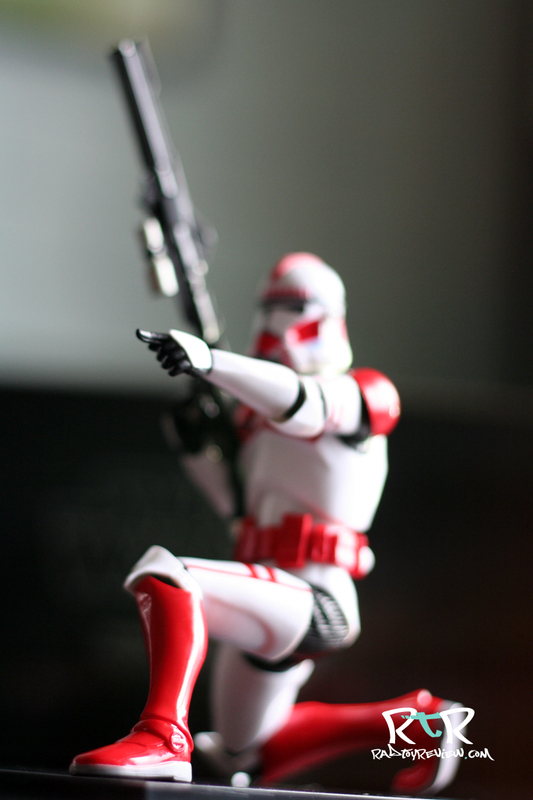 The line blurred further as I began to delve into collecting comic book-based statues to crowd my office with. They’re awesome to look at but you can’t play with or pose them. As an adult collector, I still enjoy posing and “playing” with my toys, although certainly on a different level (I’d like to think) than when I was 10. As a 3D character artist, I really appreciate and enjoy looking at high quality sculpted characters, searching for that hidden detail that sets the whole piece off. So what do you get when you combine a little bit of toy and a little bit of statue? I think you’d get something along the lines of what ARTFX and Kotobukiya have put together with their ARTFX+ Statue series. 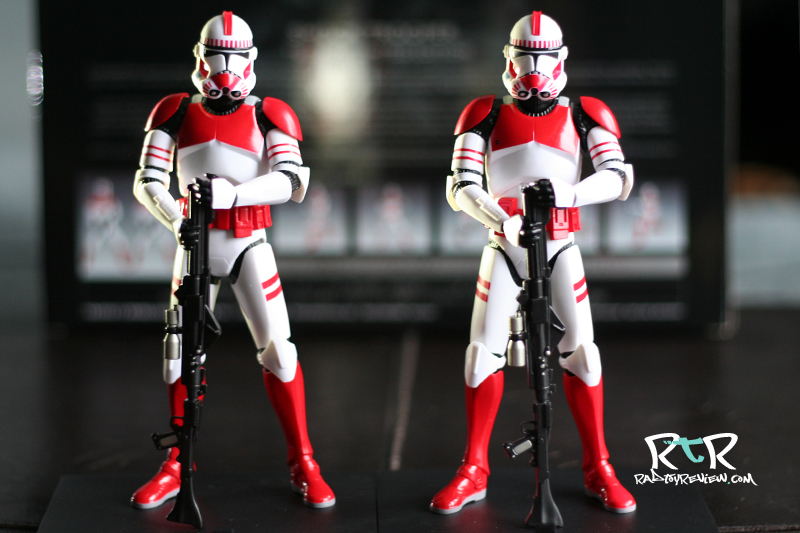 Today I’m excited to have the opportunity to review the 2012 Wondercon Exclusive Star Wars Shock Trooper Two Pack. These 1/10th scale figures are limited to only 1000 pieces and now available for preorder ONLY through Action Figure Express. 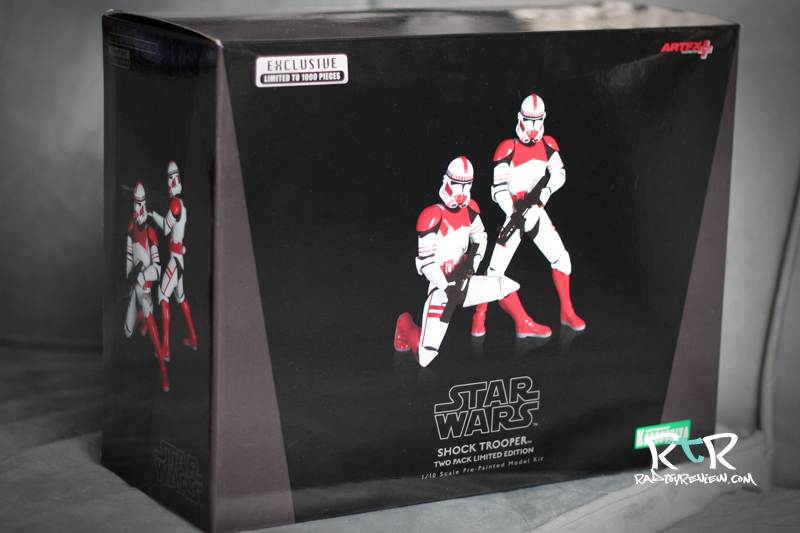 The Shock Troopers are packed up in a classic black-dominated box befitting the Empire. 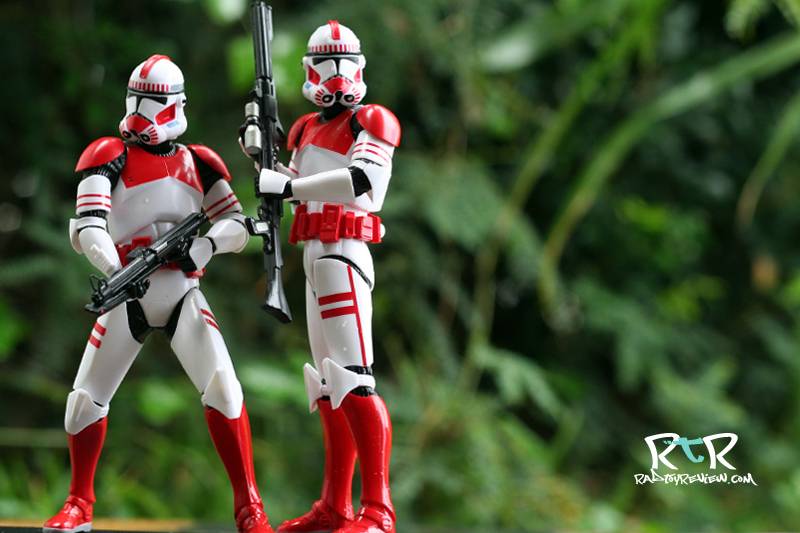 A small “limited edition” sticker on the front informs you that you’ve just gotten something only available in finite figures.”Star Wars” embellishes several of the sides so there’s little question what you’re getting into. 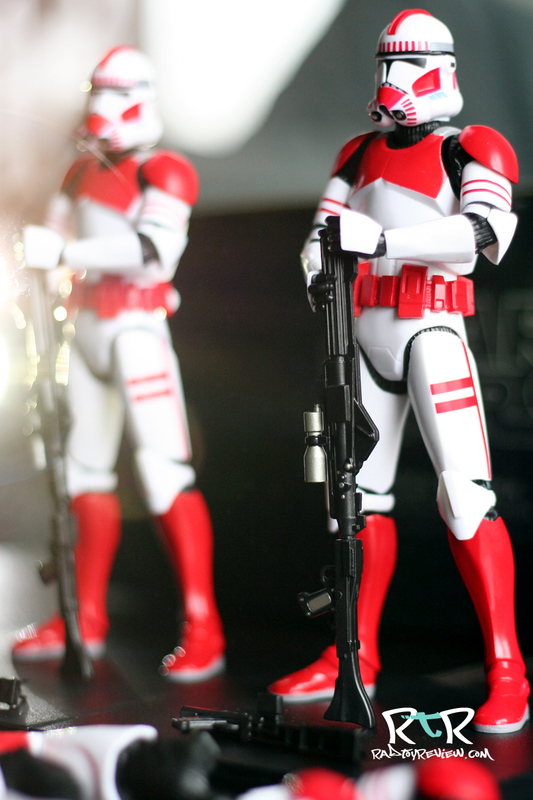 The front and back features the Shock Troopers themselves posed up in a few of their available configurations. 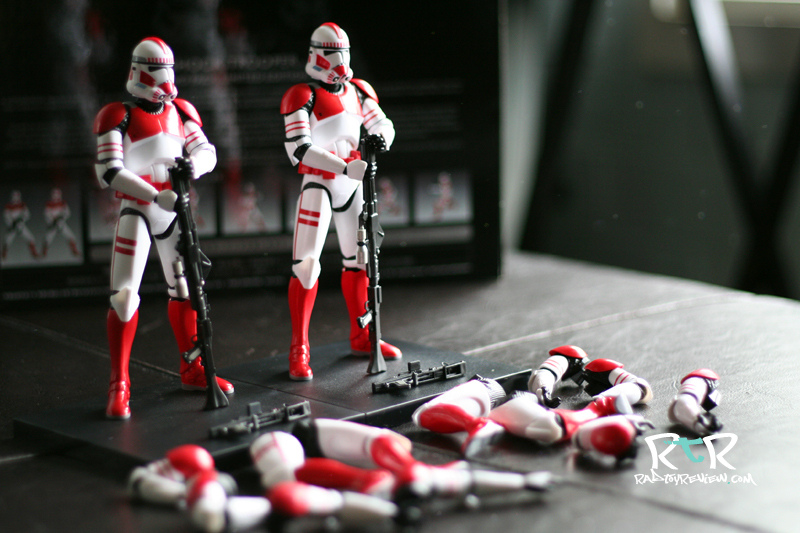 On the back, a few paragraphs give you a little back story on these elite security soldiers and fills you in on some of the things that make ARTFX+ figures unique. Once you crack her open, you’ll find all your goodies cased in a plastic prison tray. It’s a pretty daunting amount of individual odds and ends. 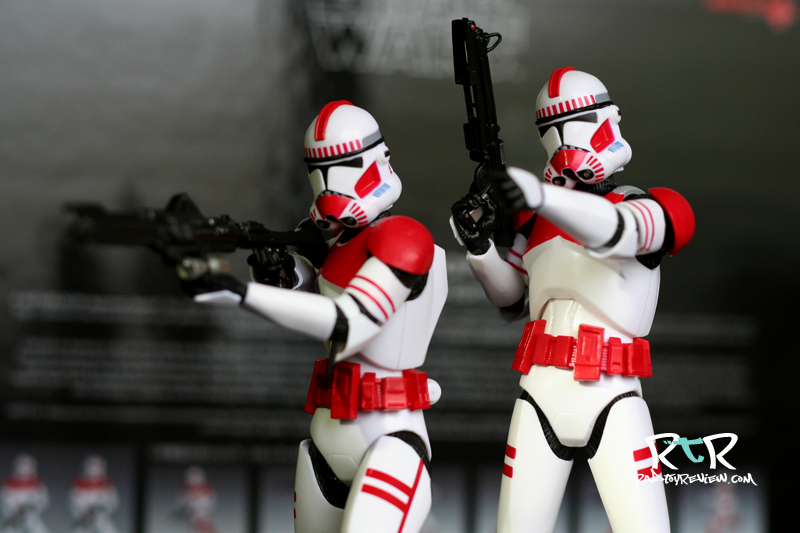 You have your two base Shock Trooper bodies, ten extra arms, four extra legs, two DC-15S carbines, two DC-15A blaster rifles and two magnetic bases. Each one is individually packed in little plastic sleeves. You could probably watch the entire Star Wars collection including the 1978 Holiday Special (slight exaggeration) by the time you got them all unwrapped, but the pile of stuff you have left over once you do should get you pretty excited to start piecing together what kind of options you have in front of you. I really didn’t know what to expect when I started to rummage around with this set. 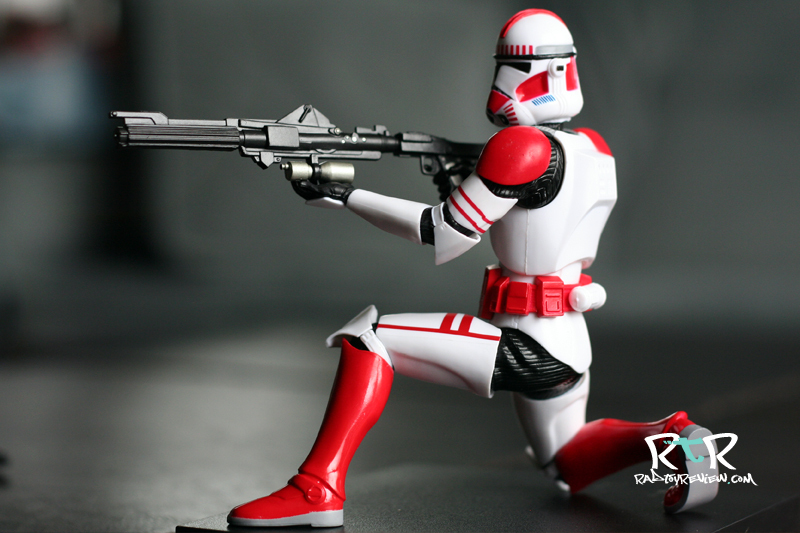 I’ve been a fan of Kotobukiya’s Bishoujo line for awhile now as well as a (almost-goes-without-saying-because-I’m-an-adult-toy-collector-running-a-website-about-toys) huge fan of Star Wars. 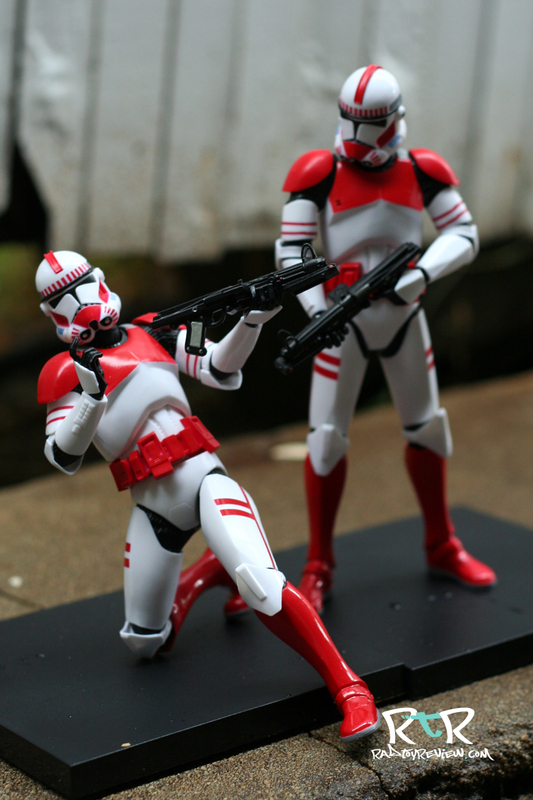 I’ve had countless Star Wars toys and Koto’s Bishoujo statues are of course pvc plastic statues. I’ve never had a difficult time telling them apart. But I’ve never had a statue that’s not quite a toy but not quite not-a-toy either. The only thing I knew to do was to jump right in. 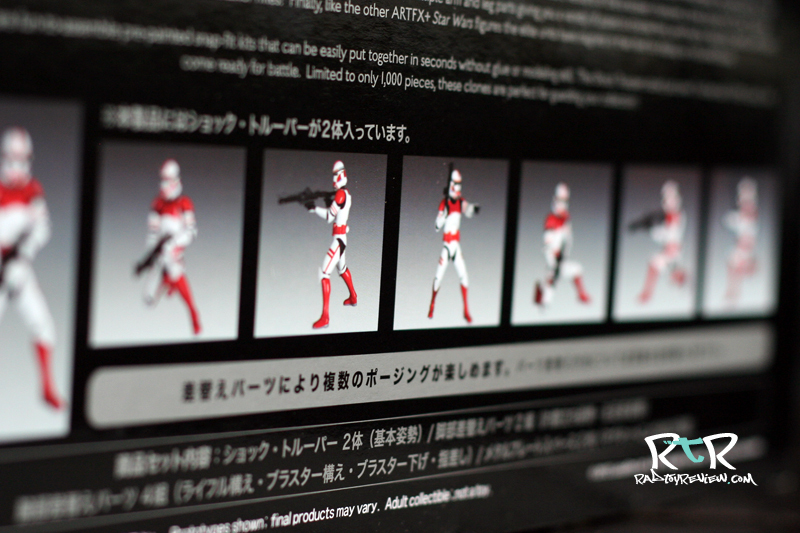 There’s a little instruction paper included with the set that shows the default stance for the troopers. 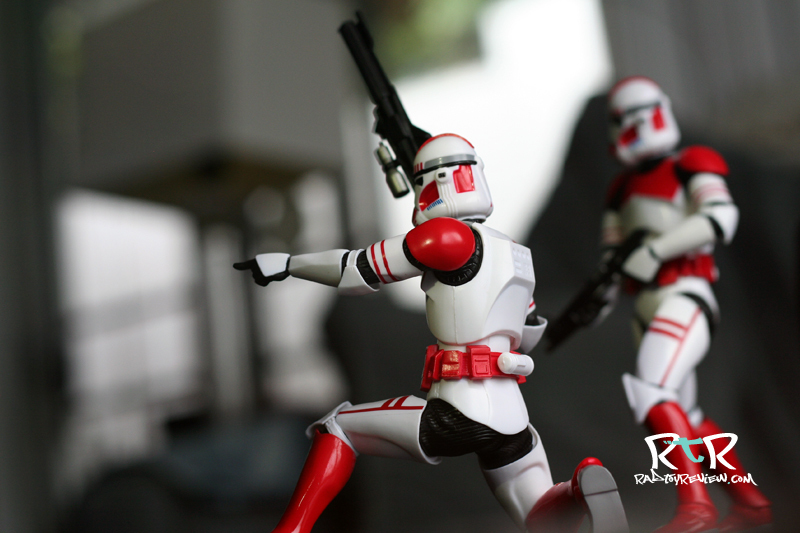 It details how the arms for that stance have hands that swivel at the wrist to help you better get the pose just right. At the bottom of the page it also gives you a handful of reference poses to point you in the right direction with the other pieces. After that, you’re pretty much on your own. Like so often is the case, I skipped the directions my first go and just got right into mixing and matching pieces to see for myself what would and would not work. First, let me just say that I really like the magnetic bases. 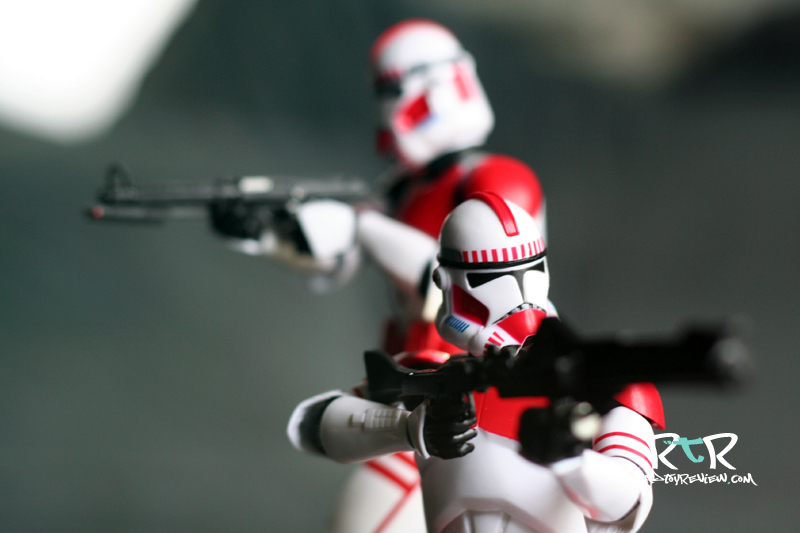 It’s such a simple but great idea that makes moving these guys around into various positions so much easier. No worries for balancing them or one toppling over once you get them arranged like you want. The base will hold them nice and secure. How the pieces fit together is pretty self explanatory. Peg goes into hole. 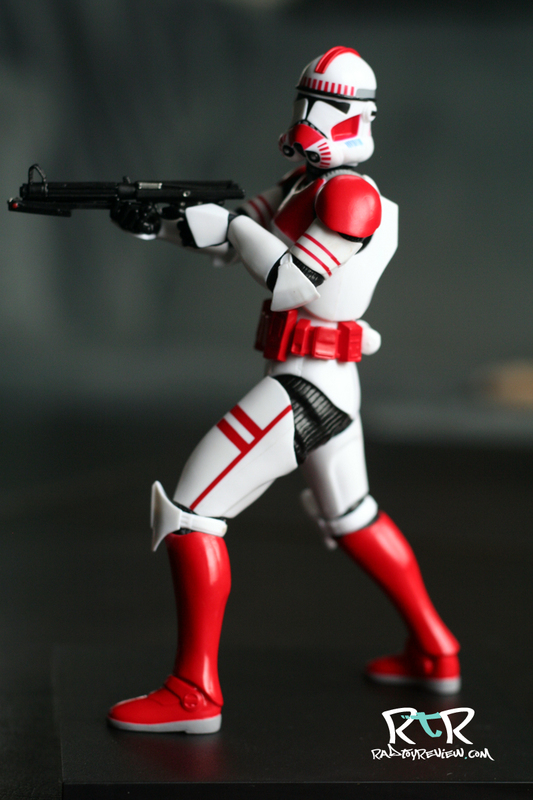 You can’t jam a left arm into a right’s spot just as you can’t have your Trooper sporting legs for arms. The joints fit nice and snug with very little wiggle room for error. I found everything to be fitted very exact with hands meeting the rifles soundly as expected. 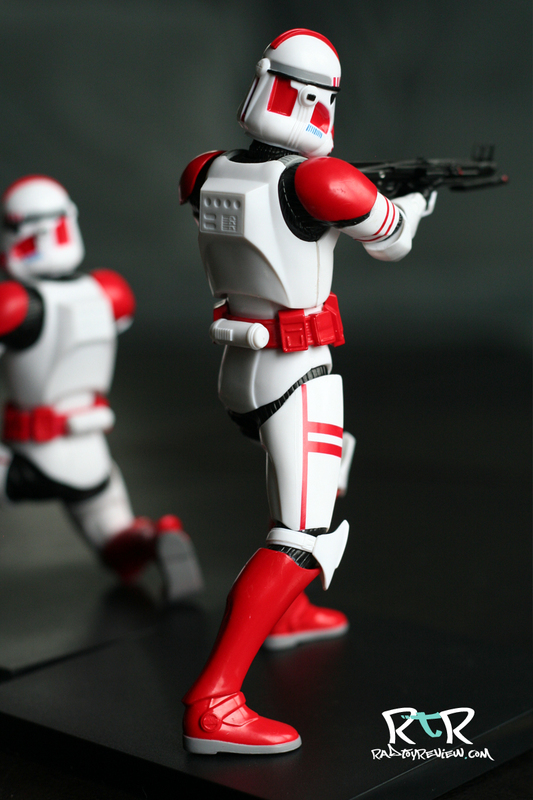 Aside from letting you switch out different limbs, each Shock Trooper’s head is on a ball joint and can be rotated side to side/front to back. 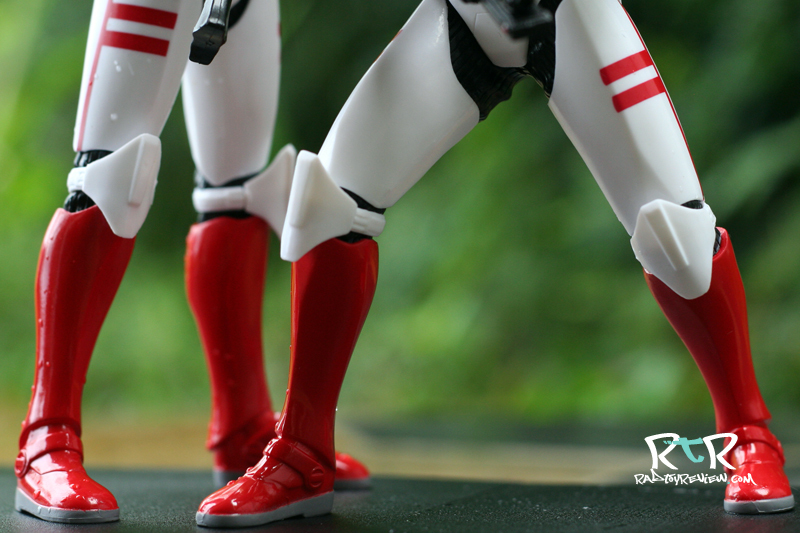 Coupled with a twist joint at their waist, this adds further flexibility to your setup. One thing you’ll notice if you start blindly placing pieces as I did, is that not all configurations are created equal. While I found one or two variances that looked alright to me, you pretty much can’t stray too far from the options shown in the instruction paper. This isn’t a bad thing at all as the poses given are dynamic and “tell a story”, it’s simply the intent of the design. But if you went in blind, it’ll take you a few minutes to sort it out. Lesson learned: Read instructions. So after playing with these guys for about an hour, I’ve gotten a pretty good handle on what arrangement I think looks best and a pretty solid grasp on ARTFX’s interchangeable limbs system. But what about everything else? Are these guys well made? Are they worth the cost of admission? Are they cool? 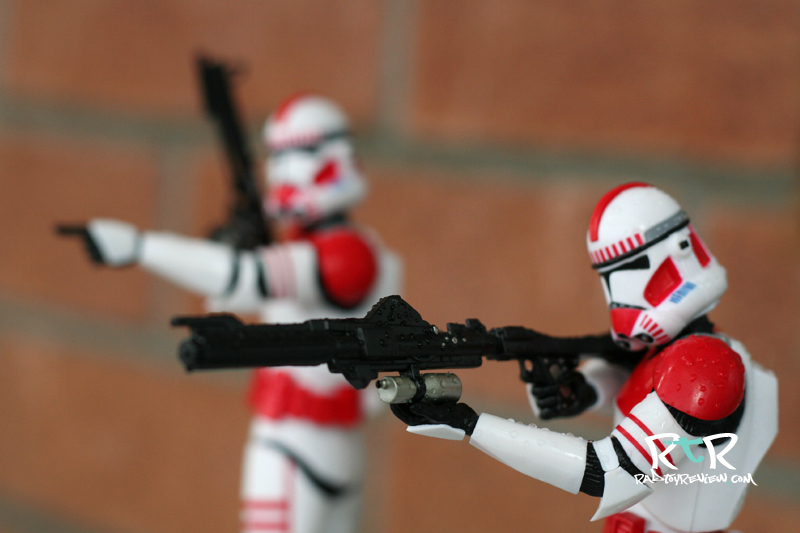 I was pleasantly surprised with the nice solid feel of these figures. I’d compare them to high-end models minus having to worry about glueing your fingers together or delicate pieces snapping off. 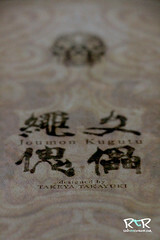 The sculpt itself is clean and accurate to the character design. 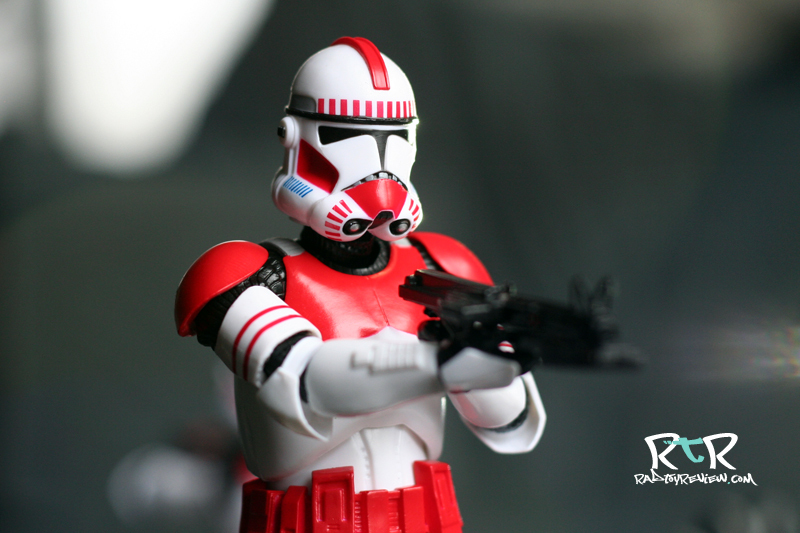 Details like the wrinkles in the cloth under their armor add a few nice subtle touches. Individually sculpted, yet already attached, pieces for the elbow/knee pads, hand/shoulder guards and belts gives them a convincing layered look. The paint application, being mostly red and black accents on white plastic is pretty straight forward. These guys must have just had their armor dry cleaned or never seen a second of battle because there isn’t a speck of dirt or grime on either of them. Because of their incredibly clean look, there really isn’t a ton to discuss except to say that what’s here is done well. The bold red is a good deal glossier than the white, particularly in the boots. Whether this was by design or simply the result of paint vs plastic, it definitely adds to the overall look. I’m a child of the 80’s and thus have always been a much bigger fan of the original Star Wars trilogy than anything related to the franchise that’s come along since. 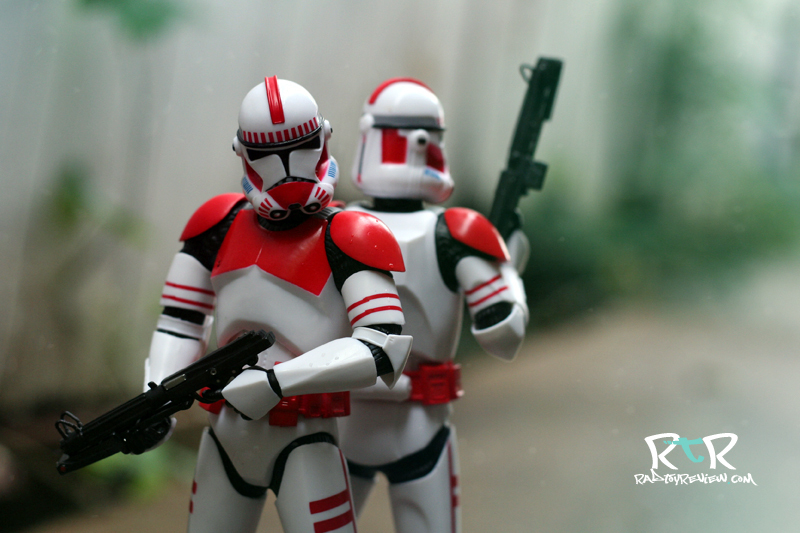 But I admit, prequel or otherwise, I really like these guys. 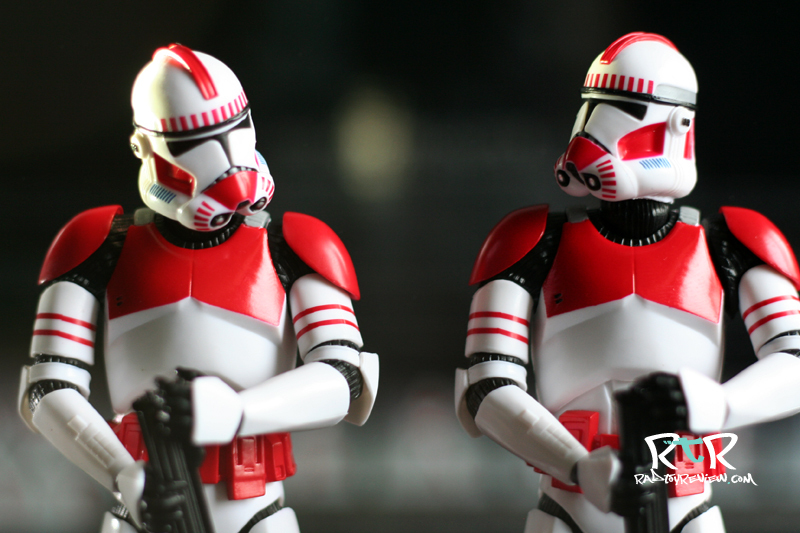 I can imagine how great they’d look with a few other Clone Troopers and maybe a Jedi or three. Once I got my head away from the “toys or not toys” thought bubble, I started to really enjoy the simplicity and exactness of their design. I’m happy with the way I’ve set my little crew up. I will probably leave them that way for a couple of months, after which I’ll swap a few things out and be good to go for another few. ARTFX+ Statues are all about giving you a bunch of fun options and basically letting you squeeze a little play and interaction out of what would otherwise be a couple of static figures. 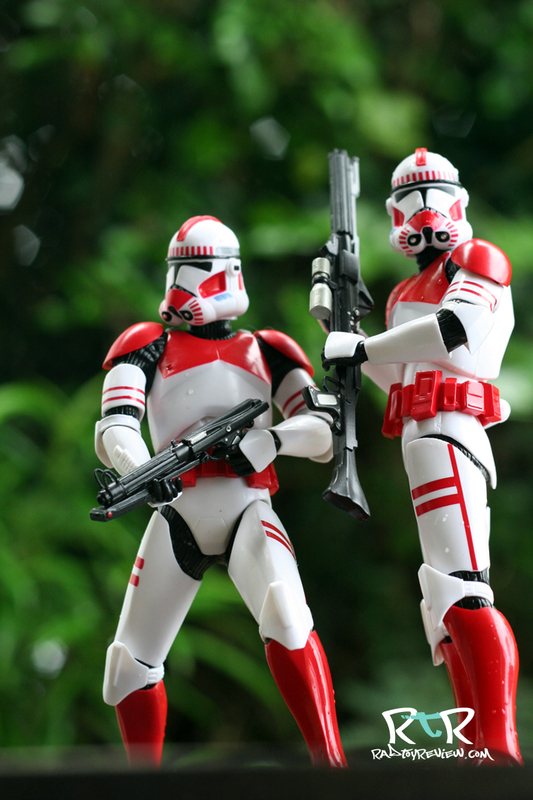 If you fancy yourself a Star Wars fan, whether or not you’ve ever experienced Kotobukiya/ARTFX+ Statues, I highly recommend giving this Limited Edition Shock Trooper 2-pack a look. Though I must caution that if you pick it up, you might want to clean some space off your shelf because I highly doubt it’ll be your last. I can see a slippery slope a mile away. You’ve been warned. 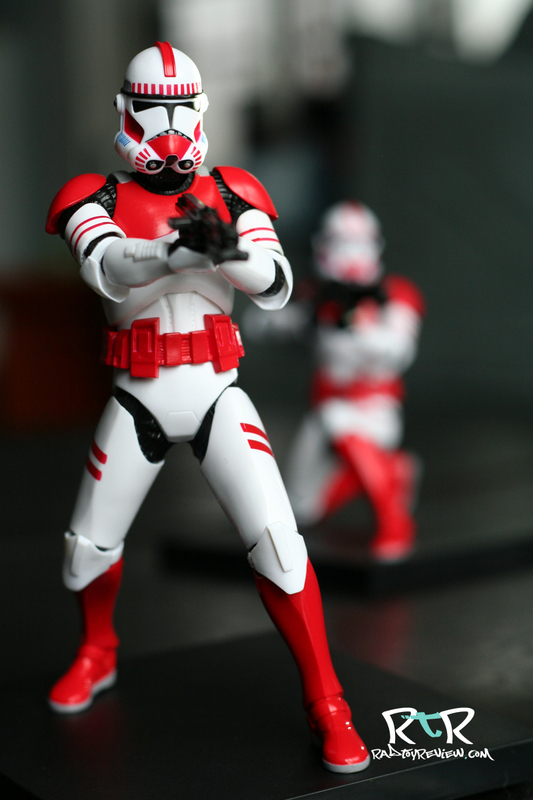 A big thanks to Kotobukiya for providing us with this set to preview. 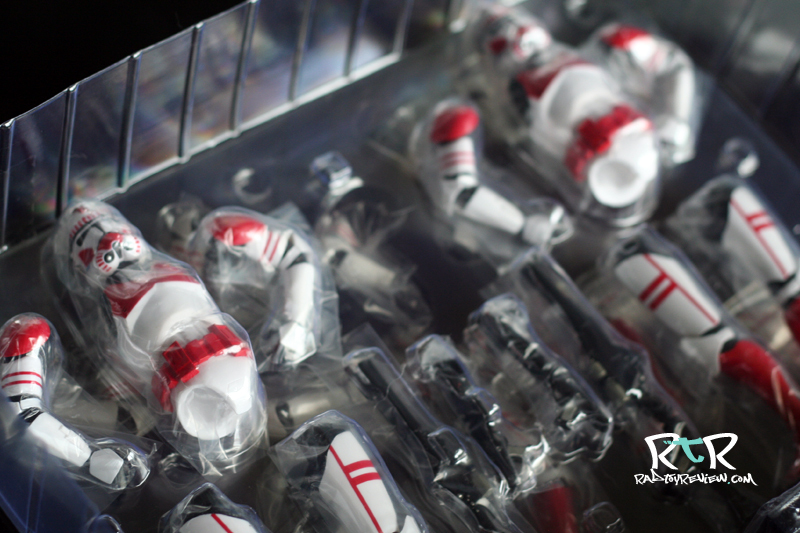 Make sure to hit up Kotobukiya’s Facebook page to stay updated on all their upcoming releases! If you’re interested in preordering this exclusive set, head on over to Action Figure Express and they’ll take care of that for you lickity split! If you’re digging our style here at RtR please show us some support by following us on Facebook and Twitter. That way you’ll be updated whenever we post new shenanigans! they look really neat for what are mainly suppose to be statues. espically having some movement in them. not to mention love the color.